She had many patches of vitiligo on her left leg, below the knee-joint and few spots on her right foot. She did not have any family history of vitiligo. She was into IT and worked for a reputed company in Pune. She was staying in the hostel in Pune. Her parents were residing in Mumbai. She was basically a happy go lucky girl, very intelligent; she always stood first in her school and college. She was good in sports, drawing, and painting and cooking. She had a very jolly nature. Her parents were very supportive. She had an affair with a Bengali boy. He worked in a oil field. Her parents supported the marriage, but the boy`s mother was against the marriage as she was not a Bengali girl. This lead to severe stress and anxiety. In this stress, she developed the patches. She was very stressed that the spots should not spread on her face, as it would have caused further problems in her marriage. She had a craving for fish, sour food, junk food and spicy food. She was intolerant to cold weather. 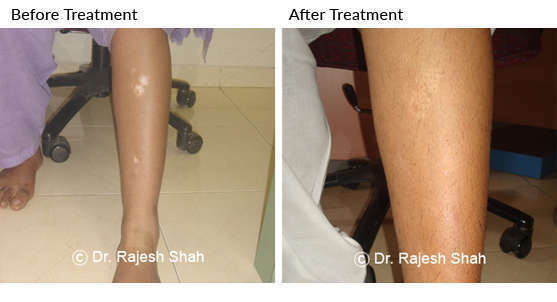 Dr Shah examined the spots and consulted her and prescribed Phosphorus 30c and his research based remedies. In four months, their was 20 % improvement in the spots. In 8 months of treatment, around 50 % improvement was noted. In 12 months of treatment, she showed around 90 % re-pigmentation. She was very happy with the treatment as she got a good cure and the spread in the spots also stopped. She was investigated for Thyroid Disorder, but her blood test for thyroid came normal. Dr Shah advised her treatment for another 6-12 months.